I miss Africa. It reminded me of Wyoming, but with elephants, and I've been missing Wyoming my entire life. The other night I watched a movie called White Material, the kind of movie that made me never, ever want to go to Africa before I went to Africa. Like Hotel Rwanda. But having been to Africa, I completely understood why Isabelle Huppert did what she did in order to stay on her plantation, despite the bad men with guns, child soldiers with machetes, and a decapitated ram's head left in her coffee beans. It wasn't pretty, but I understood. I didn't think much about food when I was in Africa, not because the food wasn't delicious but because food in Africa is dwarfed by everything else. It is dwarfed by the trees full of baboons and the vast plains, the hippos and lions and giraffes and monkeys trying to get in your room, by the waterfalls and rivers, and, of course, the problems. It seems frivolous to talk about African cooking rather than African poverty, political instability, AIDS, and rhinoceros poaching. Yet if all that you feel comfortable discussing about a place are its noble landscapes and problems, the place is no longer relatable and human. African food is wonderful. The food served to tourists, anyway, which is the only kind I ate or had the opportunity to eat. I realize this is not what ordinary Africans eat, but is still African food: food cooked by Africans in Africa using African recipes and African ingredients. It did not taste like any food I had ever eaten before. African food, in my brief and very limited experience, is strong and spicy and hearty, often served with pap, a starchy cornmeal porridge much like polenta, but not cheesy or buttery. We ate a lot of this porridge alongside curry-like stews accompanied by chutneys and incendiary pepper pastes. (A creamy spinach-peanut braise served with some porridge was the best thing I ate the entire trip, and I am determined to replicate it at home.) I worry that some of the flavors will be impossible to capture here -- the beef tasted different and better than American beef, and I ate a butter cookie that tasted 10 times better than any butter cookie I ever encountered in my many decades of butter cookie consumption. I started thinking maybe it was made with cape buffalo butter after someone told me they make cheese out of cape buffalo milk. It is a brave man or woman who tries to milk a cape buffalo. Anyway, when I got home, I immediately opened The Soul of a New Cuisine by Marcus Samuelsson to learn more about African cooking. This is a beautiful and inspiring cookbook, full of gorgeous pictures and tempting dishes, but it is very high end and cheffy, with recipes for things like quail-foie gras soup and tangerine consomme. Tangerine consomme sounds lovely, but it doesn't sound African to me. Amazon reviews of the book are mixed, as are the notes from Eat Your Books. I am especially discouraged by a thumbs-down report on Samuelsson's injera recipe as I am determined to learn to make injera. 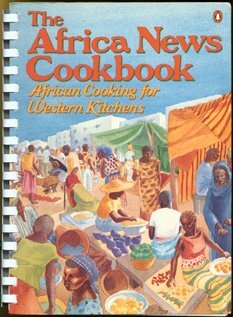 Then I pulled out The Africa News Cookbook, which I bought some years ago. I can't remember why. It is a homely looking spiral-bound cookbook, lacking lush photography or lavish recipes. Amazon reviews of this book are outstanding. My plan is to cook a few dishes from Samuelsson's book this week and then cook similar dishes from Africa News next week, and choose the cookbook to proceed with on that basis. 2. Monday, I made Samuelsson's Jollof rice and it was gummy, dark, spicy, and studded with peas -- a one pot arroz con pollo. Owen: "I thought it was good. Not make-it-every-night good, but it seems nice for once a month." Isabel: "I thought the chicken was good but the rice had too much stuff in it." Husband: "The chicken would be better if it didn't have any bones in it." 3. Tuesday night, I made Samuelsson's kofta meatballs with okra tomato sauce. I had expected meatballs with a little sauce that you could serve on a plate, but ended up with a viscous okra soup in which floated big, tender meatballs. It was gumbo-like and I loved it. I was alone. Isabel: "The meatballs would have been better by themselves." Husband: "I thought it needed a noodle in it. The okra is a little bit off-putting." Owen: "I liked the flavor of the meat, but that vegetable is not the kind of taste that I like." I love Ownen's qualification, not every night good, just once a month good. And my family is with your husband on the chicken with bones category. I, personally, do not see the problem. Such a good post. Off to make turtles. Not to ignore the remainder of your post, which is rich and thought-provoking, but I must state that I had no idea you were the kind of person who can miss Wyoming. How did this come to pass? Because Wyoming is, I feel, an acquired taste. Some parts more so than others. So eager to hear more about African Cuisine! I simply MUST read your blog more often. You are SUCH a good writer and it is a delight to read about your kitchen and eating adventures! And Michael wants me to tell you that he especially would be a willing and eager participant for your African recipe testing. He loves Jollof Rice! There's also a recipe in Rebecca Wood's The Splendid Grain, one with an overnight rest (Like Boyce's) and a "traditional" recipe that ferments for 2-3 days.